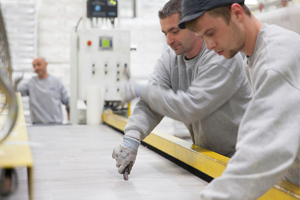 Operators, technicians, supervisors, management teams and production engineers, engaged at the Core of our business are responsible for the smooth running of the production in our different manufacturing sites. Just-in-time production, respecting the safety and quality standards are the daily concerns of these teams..
Customers all over the world. Production sites in Europe and Asia. N° 1 in France, n° 2 in Europe, n°3 world-wide in vinyl floor coverings. How can we improve ? Specialised commercial teams dedicated to each sector of activity are on hand to answer this question, because each floor covering is specific to its particular market. Thanks to its presence on every site, the Human Resources teams achieve the coordination of the social policy in its global fields : recruitment, training, mobility, staff management, communication within the Group, health and safety at work, organisation. Our HR teams are on hand to support and advise Operational Managers in their management roles. Managed from the headquarters and as far as the Accounting and the Finance are concerned, relayed by local structures, these functions rally all their know-how for the benefit of our Group's efficiency. Innovation, key to our success : constant research. The ISO 9001 certification of all our sites. A strong commitment to protecting the environment. 4 major markets, 4 major businesses, all with varying requirements. Within a matrix structure, our Purchasing teams are present on all sites and deal with every purchased product range : raw materials, technical products, transport & logistics, communication, overhead expenses. Our teams focus on the consumers needs, internally as well as externally in order to optimise the Group's purchases. This is the essential link for the communication between people, departments within the Group and with all our external partners. These teams use their knowledge and bring their suggestions with the goal of optimising the costs and improving the customer service.